This post is a wall-of-text because in my excitement over how much work I put in the tournament I failed to take ANY pictures of the table. I had a field with tents, horses, a tavern and everything set out. Nuts. “Once again, we come together thanks to the generous contributions of the Order of the Sacred Flower.” She pauses for a moment as the crowd cheers for a group of assembled knights with lotus flowers on their tabards. With that, the tournament began and the crew of the Sea of Stars were approached by Maxim, the tournament scorekeeper and registrar. He introduced the other teams competing: the Order of Truth, Storm Company, the Knights of the Sacred Flower—the tournament sponsors, Companions of the Crucible, and the Free Citizens of Bryttan. The first event was the Grand Melee, a tournament of chivalric, single combat (no magic). Veya and Sumner signed up for that. Zinianna signed up for the Archery Contest. Straxius signed up for Arcane Archery. Straxius signed up for the Joust, and they would all participate as a team in the Urn of Wits challenge and the final Hedge Maze Challenge. After easily defeating Grinder the Uncouth of the Free Citizens of Bryttan and Jaana the Hammer of the Order of Truth, Veya faced her 3rd Tier opponent, Dupre the Pure, also from the Order of Truth. Meanwhile, Sumner faced off against Shamino the Swift of the Order of Truth, then Grond of the Companions of the Crucible before facing his 3rd Tier opponent, Talos the Elder of Storm Company. Both Veya and Sumner defeated their 3rd Tier opponents, leaving them to face each other in the Champion Round. That would have to wait a few days, however, to give the tournament participants a chance to rest. Meanwhile, Straxius faced off against Pelgor Quickfingers of the Companions of the Crucible in Arcane Archery and defeated him. Due to a lack of opponents, Straxius merely needed to be Grigori the Dark’s score to advance to the Champion Ship round. Grigori the Dark, of the Companions of the Crucible lost his 3rd Tier challenge to Valen the Ponce of the Knights of the Sacred Flower. Straxius beat his score, then faced Valen the Ponce for the Championship, convincing the boisterous knight that competing drunk and blind-folded would prove their worth. Valen agreed and competed, not knowing Straxius used his connection with his familiar to see through its eyes. Still, Valen’s skill was formidable and he only narrowly lost to Straxius. The Captain of the Sea of Stars was crowned Arcane Archery champion and granted the Earthtender Circlet as a prize (a circlet of blasting). Sumner geared up for the joust, using his summoned steed after it was deemed that his Celestial Elephant, Stampy, from his figuring would provide him with an unfair and ultimately impractical advantage. (Why yes, I DID buy empty halves of coconut for this.) First, he jousted against an opponent from the Grand Melee, Talos the Elder. He unseated the old man then was challenged by Jaana the Hammer. After defeating her, his opponent was Dupre the Pure. Once again victorious, Sumner’s final opponent was Valen the Ponce. They made multiple passes and with Sumner’s unhorsing their scores were tied! Sumner demanded satisfaction from Valen the Ponce, but was unable to control his rage at the knight’s good natured boasting and the ignorant comments of other participants comparing the minotaur (whose race was unknown on Brintannia) to a bovine. He broke the rules of the contest and was disqualified for using magic to paralyze The Ponce. Valen was crowned Champion of the Joust and accepted the Gweardon Fortress (Daern’s Instant Fortress) as his prize. Zinni was confident the Archery Contest would be little challenge to her and after defeating Pelgor Quickfingers, Loren Smythe of the Free Citizens of Bryttan, and Katrina Trueeye of the Knights of the Sacred Flower, she faced her final opponent, Garrett the Lame, also of the Knights of the Sacred Flower. Despite his slow, hobbled gait, he proved himself the better, or luckier, archer and limped away with the Champion title and the prize, the Quiver of the Blessed Huntress (a Quiver of Ehlonna). During the period in which the melee participants rested, the Urn of Wits challenge was held. A pedestal was placed on a large rug in a pavilion. The rug was large enough no one could leap to the center to reach the pedestal. Upon the pedestal was an urn. The object was to retrieve the urn without using magic and without walking on the rug. Heated debates broke out amongst the teams. The crew took knives to the pavilion tent to create a long section of fabric which the placed on the rug to walk on. The challenge proctors called foul and while they were arguing over the wording of the rules, Valen the Ponce knelt down and rolled up the rug to walk on the grass until he reached the urn. The challenge proctors declared the Knights of the Sacred Flower the winners of the Urn of Wits Challenge. This announcement was met with much grumbling by the officers of Sea of Stars. Nevertheless, the tournament proceeded and, it was time for the presumably rested and healed melee contestants to face off for the Championship. Sumner was reminded in no uncertain terms that magic was prohibited during the challenge and he faced off with Veya. While Sumner provided a bit more of a challenge than her previous opponents, the barbarian powerhouse from Faerun defeated the minotaur from Ansalon (Krynn). She accepted the title of Grand Melee Champion and the prize of an Adamantine Breastplate from the vaults of the Knights of the Sacred Flower. After a final evening of rest, the last day of the tournament and the Hedge Maze challenge arrived. 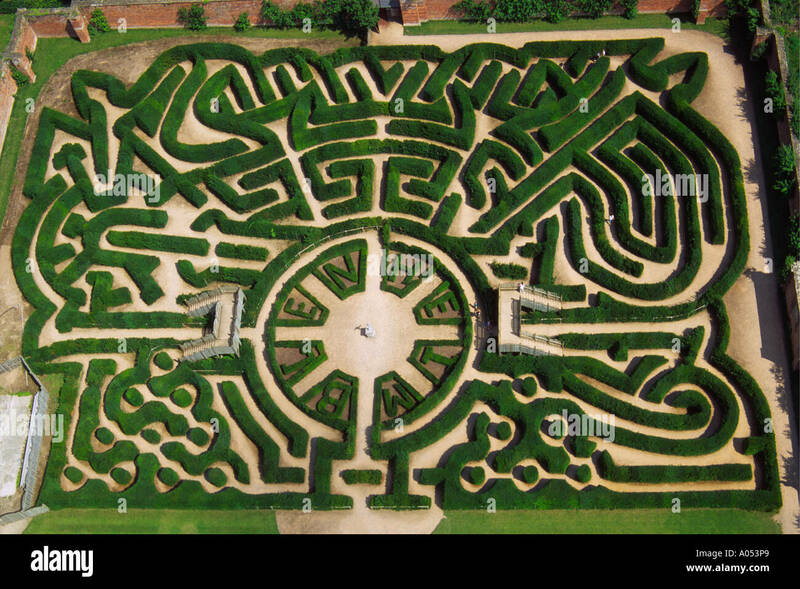 (I used the Blenheim Palace maze in Oxfordshire, UK as the model for this maze.) Maxim was careful to explain that divination, flying or levitation magic, or any other means to see an overview of the maze by participants would result in instant disqualification. Once the rules were clarified, the challenge began. Luck was with the crew and they entered the maze first. When they estimated they were about halfway through the maze, the skies darkened unnaturally fast and the skies roiled, filled with swirling clouds of unholy color. Screams from the tournament grounds outside the maze alerted them that the magical storm was not part of the challenge and they called upon their magic to exit the maze quickly. The people in the tournament grounds were panicking while the knights not participating in the maze challenge tried to calm them. After questioning a few people, they learned that Queen Garria was abducted by three shadowy creatures. The crew set off in pursuit, finding signs of a struggle in a nearby copse of trees and further signs that the three shadow-creatures took to the sky and flew off with the queen. Her majordomo, Lord Blackthorne was reluctant to accept the crew’s help, but finally relented. They returned to the palace and questioned some witnesses. After discussing the issue with others, they decided to go to the Knights of the Sacred Flower and the Order of Truth for assistance. To their chagrin, Valen the Ponce turned out to be the leader of the Knights of the Sacred Flower. He was all too happy to assist them, however and confided that they had little faith in Lord Blackthorne’s ability to fairly and safely deal with the panicking populace. At the Order of Truth, the crew searched through their library to learn the shadowy creature were, in all likelihood, the Shadowlords. The Shadowlords, three powerful creatures with ties to Orcus, were thought to have been vanquished ages ago. Their lair was located in the Underworld; a dark place of deep caverns to which no one has traveled in decades. The officers of Sea of Stars began their preparations for a long trek into Brintannia’s underdark…. The tournament went pretty well. I was surprised the PCs didn’t walk away with all the prizes, but at least I feel satisfied that I didn’t just hand them everything without a challenge. I will admit some of the wording for the Urn of Wits challenge could have been better, but I forgot that, when dealing with D&D players, they’re going to Rules Lawyer the absolutely living flesh off the bones of any challenge with in-game rules. I also got so caught up in tracking the challenge results in the brackets I created that I forgot to give out inspiration for some particularly good bits of role-playing. Maybe one of them will see this and remind me at the next session. Also, I was surprised how quickly they leapt to offer to go after Queen Garria. Damn, that’s heroic! If I remember when I return from Gary Con, I’ll summarize how I ran the tournament in a separate post. I wasn’t trying to simulate every little detail and I think it worked out pretty well. The tunnel leading from the tomb meandered through the rocky underground until it opened into a flooded cavern. Gnolls filled the shores of the subterranean lake and quickly moved to attack. After dealing with them, the crew heard chanting from deeper within the cavern, so they circumnavigated the lake and proceeded deeper into the depths. The natural tunnel gave way to a constructed area; a ritual room of sorts. Three druids were bound, up to their necks in a pool of blood while gnolls snarled and chanted around them, led in their dark worship by warlock bent on summoning some fell creature. The crew of Sea of Stars leapt to the attack, intent on interrupting the foul ritual and saving the druids. After a pitched battle, the crew emerged victorious and pulled the druids out of their bloody prison. They led the druids out and found the fire fog was gone and the bleak pall hanging over the grove was lifted. The healing could begin. Back in Bryttan Castle, Queen Garria expressed her thanks at their efforts and invited them to stay a while. The Tournament of Flowers was starting a few days and they were all invited to attend and participate if they so chose…. This may seem brief, and it probably is, but I got caught up in doing final edits and revisions to my next novel and really didn’t have a lot of time to do a detailed synopsis while trying to prep for the next session and finalize preparations for Gary Con, too. I could’ve summed it up in two sentences: The PCs killed all the gnolls and their leaders, and saved the druids. In gratitude, the Queen invited them to attend the Tournament of Flowers being held in a few days.